It seems like every offseason for the last several years, there has been reason to write a piece on Dez Bryant and where his career is taking him and his team. He has been the face of this franchise for a few years running, as a bridge between the older Cowboys (Tony Romo and Jason Witten) and the new ones (Dak Prescott and Ezekiel Elliott). He has more jerseys sold and more fans for life than almost anyone in the 19 seasons I have covered this team. He is adored and revered by almost all, local or national. You won't often find wide receivers with that type of brute strength. His personality and charm simply run up the score, but at the core is a player who could not be stopped when he was determined to get into the end zone. And yet, in this sport where recency bias plays a large role, you can definitely make the case that he needs a massive 2017 to re-establish his league dominance. Actually, you could make the case he needs a big 2017 to show he deserves his very well-compensated job in 2018. Let me be clear: I have very little belief that the Cowboys and Jerry Jones would break up with Dez Bryant in the next 12 months. He means too much to the franchise as a face, a presence in the room, and just as a marketing machine of what the Cowboys are all about. Furthermore, we know how loyal Jerry is to his favorites, and there is no question that Dez would enjoy the benefits of a longer leash. But, from a simple question of playing to his level of compensation -- what the NFL has had its top players measured on since the inception of the salary cap -- there is no question that the clock is ticking to save his massive contract from being a massive disappointment. Bryant has the second-largest contract of any wide receiver in the NFL. He signed his deal in the summer of 2015, when so many wide receivers were all getting new deals. Julio Jones got the biggest, at $71.2 million ($47 million guaranteed), and then Dez and Demaryius Thomas slid in right beneath with $70 million deals that were nearly identical -- save for Dez getting $45 million in practical guarantees and Thomas getting $43 million. These deals would take the three wide receivers from about ages 26 to 30, so we had some very interesting apples-to-apples comparisons for players in their primes at this most vital position. From this, you can see that Dez ranks last in every single category, save for touchdowns, where he outranks Jeremy Maclin by one. This is all very troubling, of course. If you are going to give your receiver top-of-the-industry dollars, then you are doing it with the idea that he will produce at his 2012-14 levels, when he was a top-five receiver in the league, thus putting himself in position to be paid like one. Back then, the top five were Calvin Johnson, Demaryius Thomas, Antonio Brown, Andre Johnson, and then Dez Bryant. Vincent Jackson, A.J. Green, Jordy Nelson, Julio Jones and Brandon Marshall were likely the next five. You pay guys based on what they have done to set the pace for what they will do. Unfortunately, -- and, again, it is important to remember that this is through no fault of his own -- he has not played anywhere close to a top-five level. In fact, last season, he was 84th in receptions, 51st in yardage and tied for ninth in touchdowns. He had 3-4 incredible games, including his big night in Pittsburgh and a really big day against Green Bay in the playoffs. The biggest issue with Bryant's production, obviously, is his injury situation. In 2016, he suffered a concussion and a hairline fracture in his knee. In 2015, he broke his foot twice and required surgery, and appeared try to gut through the pain. Nobody would ever question his toughness or amazing physical style. But, with players who fit this profile in any sport (but especially this one), they don't always age well. By the way, if you would like some more rankings and stats, here are those same tables for 2015-16 as they pertain to the Cowboys themselves. If we are blaming the quarterback situation from 2015, or the rookie quarterback in 2016, that would apply to these players, too, right? So, again, he can still catch the fade for a touchdown and is impossible to cover in the red zone, but as far as catches or yardage go, he is fourth out of four, and one of those four is a 35-year-old tight end in Witten. Surely, his luck has been bad and like any other contract, there is implied risk for both parties. But has he already left his prime, based on his "beast mode" style that puts too much stress on the body as he leaves his 20s? Furthermore, there is a really interesting story revolving his contract, and the way the Cowboys have handled it relative to their handling of Tyron Smith, Travis Frederick, or even Witten's. We know the drill around here. Every spring, we hear of cap stress and the need to find money. Every spring, the big earners get their contracts reworked to create this room. But, according to everyone in the know, the Cowboys have not touched Dez Bryant's contract once since it was signed. No restructuring and no pushing the cap hits down the road. They are paying him out on schedule. Why is this important? Well, I will tell you. If -- and like I wrote at the top, it is a massive long shot with the way the Cowboys love him -- they wished to say goodbye to Dez Bryant if 2017 was just as disappointing as 2015 and 2016, they could actually save quite a bit of money against the cap. In 2018, he counts $16.5 million to play versus just $8 million if they walked away from him. And then in the final year of 2019, he counts another $16.5 million and would cost just $4 million to cut. In other words, they had guaranteed Dez $45 million when he signed his deal and will have paid him all $45 million by the end of this season. All they would owe moving forward in Years 4 and 5 would be the prorated signing bonus. This may not mean anything, but in talking with a few different folks who make decisions, it is not a shock they haven't touched his deal. The feeling has always been that based on his style, when he loses his ability to simply overpower players as a receiver, his career may not have much of a second act. He doesn't have the wheels or the route-running genius to mature into a Larry Fitzgerald-type as he extends his career. Bryant is a special player with special and unique gifts. The question remains how long he can hold on to them while defenders try to attack his vulnerable knees and ankles. Again, at this point, we would still all agree that a lot of this is circumstantial evidence and we all will still pencil Dez Bryant in for 1,200-1,300 yards and a dominant 2017. His 2012-14 run looks like it might have been his peak (well-timed to get his deal in 2015), but there is no reason he can't return to that in 2017, as he is still dominating, if you look at his signature moments in 2016. But, it isn't just about his missed time. He has played in 22 of 32 games in these past few years and, of receivers who played in 22 games or fewer in the past two years, Dez still trails Alshon Jeffery, Sammy Watkins, Steve Smith, Jordy Nelson, Eric Decker and Calvin Johnson. Nelson (who did not play a snap in 2015) and Johnson (who did not play a snap in 2016) played just 16 games and outproduced Dez in every category. And, while Jordy Nelson has the benefit of a quarterback situation that Bryant has not had, it is tough to say Alshon Jeffery or Sammy Watkins or Eric Decker have had amazing situations during this span. And nobody is handing any of those guys $70 million, either. I know this will not be a popular opinion piece, and Dez Bryant is as beloved a player as I can recall, which means that even if he has another season like the past two, nobody would advocate moving on. But I do think it is interesting that the Cowboys have not touched his deal this offseason when they needed some cash. I think they have responsibly put themselves in a good spot with his money. If they need to do something, they are in a very good position to do so. Meanwhile, Bryant remains determined to re-establish his spot in the hierarchy of pass-catchers in this league. Reports of his offseason workouts all verify that he has not lost any sort of fire in his belly, and he certainly doesn't believe he has played his best football. That is great news for all involved, because 2017 is a year when he needs to quiet any sort of talk about a decline. Finally, we have dug our way out from under the heap of draft discussions and news long enough to get to a project that has been in my bin since April. I realize this is more of one of those "Ask Sports Sturm" topics, but perhaps you will indulge me to avoid exciting mini-camp news about how so and so looked like standing in the slot or so and so appearing to be in a blitzing posture on a beautiful May afternoon long enough to tackle something far more irrelevant. And that is a single, solitary Adam Schefter tweet from several weeks ago. 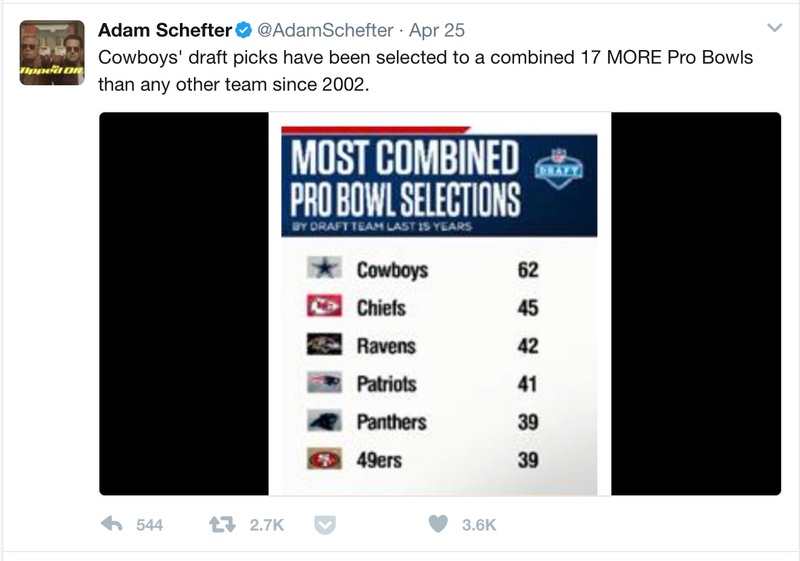 From the looks of his tweet, he merely took a picture of someone else's research, but regardless, the moment he sent this out to his vast Twitter audience, the internet broke from Cowboys fans sending it to me (and others, I am sure) who have suggested the Cowboys could improve their drafting. Now, it is an odd sample - 15 years - that should tell you right from the start that arbitrary sample sizes can give us all sorts of results to fit one's agenda. But, 15 years also covers almost every active player who is still in football, so I have no issues with it. Tom Brady and a few others predate the 2002 draft, but it is down to a simple handful. For the Cowboys 2002 is a clumsy fit. In 2002, the Jerry Jones draft room was in full effect with Larry Lacewell and friends. Then, in 2003, Bill Parcells was in full power and cleaned out a good part of the front office (Lacewell) over the next few years. By 2007, when Parcells was gone, it seemed to be a Jeff Ireland draft. And then by 2008-2010, it seemed like Jerry Jones, Wade Phillips, and even Lacewell was back in the mix to some extent along with young Will McClay and Stephen Jones beginning to have bigger seats. By 2011, we believe that Jason Garrett, Jones, and McClay started having a greater influence on things and that has only grown until now. So, 2 things from this paragraph. 1) I used the word "seemed" a lot because the Cowboys are great at not being fully transparent about who has what say on things - partly because I think it has changed countless times. There is not a consistent system that can be pointed at as their way of doing business. Some times Jerry Jones has the influence. Other times, they will say they asked Butch Davis to vouch for Bruce Carter or Rod Marinelli to break a tie on Shariff Floyd and they would. And 2) the front office has evolved into at least 5 different groups of football brains in these 15 drafts. Jerry has always sat at the head of the table, but the others may vary. 1) I agree, pro bowls are a very sloppy way to measure quality. Every year, the cliche is that everyone gets to go to the pro bowl. It doesn't prove anything. We all agree. 2) the NFL average is 29 per team and the Cowboys have 62??? Seriously? Yes. 3) Let me stop you before you say it. 62 Pro Bowls did not really translate to playoff wins or a Super Bowl. We get that. Everybody does. If you were forced to choose between good players and a good team, you would always take the team. But, usually, having good players helps make a good team. That is what is weird about this. 4) It should be pointed out that during 2002-2016, there have only been 8 teams in the entire NFL that have more regular season wins than the Cowboys. The Patriots, Colts, Steelers, Packers, Broncos, Eagles, Seahawks, and Ravens. So, while many act like the Cowboys have been bad during this stretch "since the triplets", we should at least point out that on a winning percentage basis, they are still a top 10 team during their "down time". At 131-109 over those 15 seasons. Pretty good, to be honest. 5) 2nd place is the Chiefs. Also surprising and also no real post-season achievements of note during this stretch. And they are actually sub-.500 during that stretch. So, how do they get to 62? Well, Jason Witten has 10 and DeMarcus Ware has 9. Roy Williams and Andre Gurode both went 5 times each. Tyron Smith and Jay Ratliff are both at 4. So, we already have 37. Zack Martin, Travis Frederick, Dez Bryant, and DeMarco Murray are all at 3. That puts you at 49. So, just with those names, you already are better than any other team in football. Sean Lee and Terrance Newman both have 2 and then 9 more guys each have gone once. And this number does not even include Tony Romo. Romo was undrafted, so he is not included. So, if you really want to run up the score, you would put Romo's 4 pro bowls - 2006, 2007, 2009, and 2014 spots - and get to 66. Again, this is not to suggest anything more than I find it amazing. The entire league thinks getting to 40 is impressive. The Cowboys have 66. But, again, what does the Pro Bowl even mean? Anyone of us who follow football know that All-Pro teams are the real bar. That should tell us the true story. Only 22 players a year get to the All-Pro 1st team that puts these guys into the Hall of Fame. One of the highest honors a football player can receive. I was amazed when I saw this - having done this research myself - but it is true again. No team has drafted more 1st Team All Pro players since 2002 than the Dallas Cowboys. DeMarcus Ware 4, Witten, Martin, and Smith each have 2. Roy Williams, Ratliff, Frederick, Murray, Bryant, Lee, and Elliott all have 1 for a grand total of 17. Again, this leads the NFL and in a league where the average is 7.25, it doubles that total. As you can see, Green Bay has 3. Washington 0. So, 17 seems pretty phenomenal when Ted Thompson and Green Bay are credited for being great drafters. Now, here is the other side of all of this. The Cowboys have nailed the draft at the top. They have clearly done the most with their first round picks. That list of Ware, Martin, Smith, Williams, Frederick, Bryant, and Elliott tell us that they have nailed their 1st rounders as much as anyone. It doesn't say that depth is what wins in the NFL. We have always said that the Cowboys have a "top heavy" roster that has as much talent at spots 1-10 as anyone. Where they have lost - especially after December starts - is the depth down to spot 53 where they can survive the march to the Super Bowl as well as other teams. We blame these guys at the top of the roster - Romo for sure - for this team not winning the big one, but it is usually the quality down the roster and down the draft that helps these teams survive. And that is where the Cowboys are finally catching up, but have always lingered behind a bit. So, it is all true. Every bit of his tweet. The Cowboys have blown away the competition in finding Pro Bowlers and All-Pros in their drafts. They should be commended. But, of course, there is one reason why teams go through all of this and that is to pursue Lombardi Trophies. The rest of these fun facts are just numbers on a page. They are true numbers, but the league isn't impressed unless you can win things with them. They maybe on the right path now, but with just 2 postseason wins since 2002 - fewer than the Bears, Texans, Buccaneers, in fact, and tied with the Tennessee Titans - the Cowboys won't get recognition until they make these great numbers add up to January glory. Anyway, an interesting little project for you on this May Monday Morning. I'd like you to break down a realistic production road map for the Cowboys on getting to top-12 sack total. If Taco gets 5, Collins 6, etc. I personally think Maliek Collins can be a big difference-maker for other guys along the line, but don't see the individual 12-sack total. Thanks, Joseph. I was just looking at sack numbers for the Cowboys and trying to evaluate just where they were in 2016. You will hear some people discuss that the Cowboys need to improve their pass rush above all other objectives for 2017, and then you will hear other people counter with the following truth: The Cowboys had 36 sacks last year in a league that averaged 35 and finished 12th in the league in total sacks, higher than the New York Giants. That is relevant, because visually, it seems that almost every football observer in the free world would like to see the Cowboys raise their pass rush to the standard of the Giants. The Giants are said to have a superior pass rush, right? Well, if so, how did the Cowboys have more sacks? One thing to know is the following simple truth: The more time you spend with the lead in the NFL, the more passes you will have to face. And, of course, the more opportunities you have to get sacks. Therefore, we want to look at sack rate as a more relevant stat than total sacks. If Team A gets 35 sacks and Team B gets 30, we need to know that Team A had 150 more passes to defend and, therefore, 150 more chances to get to a quarterback. That would mean Team B actually was better at ending plays with the quarterback underneath a pile of bodies. This chart above shows the Cowboys in blue, the NFL average in red and the top team in sacks in green. As you can see, 2016 was not a great year for the sack. The NFL average fell pretty substantially, from 37 per team to under 35. Obviously, over the past four seasons (2012-15), the Cowboys have been below the NFL average. Sometimes a little bit, sometimes a lot. In 2016, they did, in fact, eclipse the NFL average, as teams averaged 34.9 and the Cowboys hit 36, ranking 12th in the league. It was actually pretty strong and better than 2011, when Anthony Spencer, Jay Ratliff and DeMarcus Ware walked the defensive front. Now let's check that sack rate. Here, unlike sack totals, you want a low number. This is how many plays it takes to get each sack. As you can see above, from this standard, the Cowboys were not better than league average. In fact, from this standpoint, the Cowboys actually had a worse sack rate than they did in 2015! But, in 2015, the Cowboys faced 537 pass plays for their 31 sacks. In 2016, the Cowboys did get to 36 sacks, but had 669 pass plays to achieve that total. So, in 2015, the sack rate was one per 17.3 pass plays. That number, 17.3, was the NFL sack rate in 2016. But this past year, the Cowboys required 18.6 pass plays per sack. So, the 12th-best sack total but the 18th-best sack rate. I think there are two ways to have great sack totals. Employ an unstoppable edge rusher -- DeMarcus Ware, Von Miller, etc. and the reason many of us were so obsessed with finding one of those in this 2017 draft -- or employ a deep group of guys who have high work rates and work together with stunts and games and eventually break through in concert the Rod Marinelli way. This one is the road the Cowboys are on, and by drafting Taco Charlton, they add to the group. What is amazing is that they got to 36 sacks last year without any one player exceeding six. In fact, only Benson Mayowa had six and only Maliek Collins got to five. Think about that: The top two pass rushers combined for 11 and the rest of the group accounted for 25 more! That is pretty remarkable, and I am guessing likely the best in the league at that (subtracting the top two rushers from each team's pass rush total). Now they need DeMarcus Lawrence to exceed six. Let's put him at nine. David Irving and Mayowa with six. Tyrone Crawford and Maliek Collins with five each. That is 31 right there. Can Taco Charlton, Charles Tapper, Cedric Thornton and my linebackers and defensive backs combine for nine more? If so, 40 can happen. Will LB play be better with not-100% Jaylon Smith that loves football vs. 100% Rolando McClain that loves "purple drink"? Great question. I am a huge Jaylon Smith fan, but I must admit the unknown quality of his play is a real issue. I also concede my love for peak Rolando McClain, even though we saw it so seldom. But, when Jaylon is right, I think I will take my chances with him. He is an incredible talent and a real strong off-the-field personality. I will always take my chances on players who are "all-in" and Jaylon is very much so. Now, is he still a first- or second-round talent? Time will tell us soon enough. I am sure it has been discussed in detail, but what are the ramifications for the 2017 cap if the Cowboys can agree to an extension with Zack Martin? Can Stephen free up any cap space this year by cutting the base salary of Martin with the signing bonus this year, and push base salary cap hits back to 2019, 2020, 2021 when Romo's $19M cap hit is split over the next two seasons. I doubt it. Believe it or not, Zack Martin's deal for this year sits at $9.34 million for 2017. His new deal will need to put him either at the top of the guard salaries or close. The top five guards in the league all make MORE than $9.5M per, with T.J. Lang now in Detroit at that number. The top four guards range from $10-12M a year, so the idea of saving this season is likely possible, but I am not sure I would backload deals anymore with Romo gone. Pay guys when you can, because Dak and Zeke will need deals before you know it. Use this window between to pay guys as much as you can and then you are in a great spot when others need deals. I think they are now in a pretty good spot cap-wise, and I bet Martin is next. I wonder if La'el Collins would be a good price sooner than later, even though they will keep him next year as a restricted free agent. What record gets Garrett fired next season? Man, I thought Jason Garrett was very close to being fired after 2012 and 2013. Then, 2014 happened, and aside from three different Tony Romo injuries, the Cowboys have ascended into a legit NFC power with a 29-19 regular-season record and a playoff win. That is not great -- they need to achieve greatness in the playoffs -- but it is basically a three-year run of 10 wins, something that is difficult for anyone and darn near rare around here. So, would 4-12 get Jason Garrett fired this year? Possibly, but I doubt it. I think they are now his team and are poised to be very good for several years here now. He is starting his eighth season and seventh full year as Cowboys' head coach. I think the odds are great he will serve a full decade on the job and increase his lead as the No. 2 winningest coach in Cowboys history. If you follow me on Twitter, you likely are aware that this has caught my interest quite a bit today. La'el Collins is a very valuable and under-discussed resource the Cowboys currently have on their roster that represents an added component to the 2015 draft that must be remembered. The Cowboys were coming off their 2014 season to remember and their gutting defeat to Green Bay (sound familiar?). They just needed a draft to put them over the top. Yes, Byron Jones, Randy Gregory, and Chaz Green are the 3 picks will always be listed in the history books for what the Cowboys accomplished 24 months ago on the first 2 days of the draft, and the returns on those 3 range from Jones (Pretty decent) to Chaz Green (disappointing and still thought of as quite a reach from the moment I heard the pick until this very moment) to Randy Gregory (I had such high hopes, but he definitely made everyone's worst fears come true). What we don't always recall as easily is the important acquisition (and incredibly mysterious one, too) of La'el Collins. Collins was thought of as a high first-round prospect who could play tackle or guard in the NFL and had an untimely brush with the law before the draft that never turned into anything legitimate. So, as Jerry Jones will do better than anyone, he made the call and closed the deal that basically gave the Cowboys an additional first- round pick. From there, Collins rewarded their efforts quickly. 2015 provided several jaw-dropping examples of his ability - he is #71. Collins was pretty good in limited duty in 2015 -- he provided some highlight-tape stuff as well as some rough edges that needed work -- and then spent most of 2016 injured with a toe situation that required surgery. Well, now, he is healthy, and with Doug Free's retirement, the right tackle situation seems to have a clear leader. They also wanted him to replace Ron Leary at left guard, but that seems like a much lesser concern at the moment and frankly, if you can't find a guard to hold up between Tyron Smith and Travis Frederick, that would be disappointing. Any replacement-level guard should be fine between 2 All-Pros, so the real concern is the right flank. Free had his share of complaints filed by fans and media, but he fought his tail off and seldom was seen as a liability. He just wasn't on an All-Pro level, so he stood out sometimes. But now, they need a right tackle and Zack Martin might be the best player for the part, but they aren't moving him off of right guard after he has played so well there to another All-Pro level. Chaz Green has never proven to have either the health or the technique to hold up there, so I was never buying that was their first idea. He needs to simply show he can appear at daily activities for a month straight before I seriously consider his upside as a starter in this league for a full season. So, again, we are back at Collins. Is Collins a perfect idea there? No. He was considered a guard at the NFL level because speed rushes on an island may give him fits. Vic Beasley coming off the edge is going to give him too much speed, so they thought at the NFL level, he better stick to guard. But, now, he is their best choice to try and develop him. If it works, they could have their next pillar on the line. Either way, he cannot be an unrestricted free agent until after the 2018 season (I know there are some reports to the contrary, but we have double-checked), so some more cheap labor for sure for the Cowboys. They lost quite a bit, but when you add Jaylon Smith and Charles Tapper to the list of players they grabbed in green, I think you can argue this is a very talented (and very young) group of athletes to defend the capable offenses on their schedule this season. One thing I like to do in the offseason is to try to define some things that are out there in the Cowboys world with vernacular and such that will hopefully help enhance your Cowboys viewing and understanding. I don't have all of the answers, but I am a guy who seeks them and tries to share my findings -- as well as adjust them as necessary -- to make sure we leave no eager football fan behind. There have been plenty of people asking me about this guy and that guy and why do you media guys talk like all of this matters so much? Yesterday, I had people citing Anthony Spencer and Jason Hatcher as two examples of guys who were fine as strong side defensive ends. The trouble is that Anthony Spencer was an outside LB in a 3-4 defense when he had his 11-sack Pro Bowl season in 2012. That means he is not playing the DE spot, it was mostly Marcus Spears. So, that one won't hold much water. Then, when Hatcher had his huge 2013, that was at the 3-technique, because your defensive ends were George Selvie and the final season of DeMarcus Ware. When people talk about strong side/weak side, they, of course are talking about the traditional football terms that we have used for decades to match up with an offense in 21 personnel. In 21 personnel, an offense would have a tight end on the outside of the right tackle to make that the strong side. So, your left defensive end would be strong side and would be bigger and stronger against the run. Your best pass rusher would then go weak side (away from the tight end) at right defensive end and have a 1-on-1 battle on the edge with the left tackle who was no doubt the best pass protector. Now, the problem with all of this is that traditional football and modern football do not always meet anymore, and with nobody playing 21 personnel and almost everyone in 11 personnel and in shotgun, things have modified. Both your tackles better be able to pass protect on an island, because defenses are trying to put pass rushers on both sides, because they know you are passing 60% of the time and they will be in nickel 70% of the time. So, the premiums are now on defensive ends to get to the QB and they aren't as worried about being stout against the run. And, your right tackle better be nearly as good as your left tackle at dropping in pass-pro. It is a different game than it used to be. How does all that apply to Taco Charlton? I suggest his best position might end up being DT -- at least in nickel, because he doesn't appear to be a classic edge rusher. They might get him there, but as I pointed out a few weeks back, the top 12 edge rushers in the league last year were all 265 or smaller. He is going to be 280. This isn't to say the big man can't get sacks -- JJ Watt gets them plenty, but the league seems to be valuing smaller and more twitchy quickness around the edge these days. I am curious to see how this all works. So, you are looking for corners who can play your scheme. But, what is your scheme? Oh, Rod Marinelli? Cover 2, say the national talking heads! Here is the truth. Knowing and reading coverages is a very difficult proposition. The truth is, every team has its preferences, but no team runs the same coverage all the time. They have their favorites, but like a baseball pitcher, they have to vary their approach to keep the opponents off balance. So, last summer, I went through the 2015 Cowboys coverages and tried to give you an idea of what they ran. I don't swear I had 100% accuracy, but I do swear I studied and did my best work I could do. Basically, they ran Cover 1 (Man) nearly 50% of the time and 2 different zones roughly 25% and 25% each. So, they preferred Cover 1, but in the final analysis, they ran zones slightly more. And, they would vary week to week based on who was healthy and who they were playing. You won't defend Aaron Rodgers and Tyrod Taylor the same. They didn't. So, I tell you all of that to tell you I am now about to get started on 2016's coverages to make sure they didn't alter things too much. Since they already selected their corners for 2017, we should take some hints, but we should also know that they need defensive backs, like everyone else, that can do it all well.